A study conducted in Taiwan and published in Nanoscale Research Letters, found that the use of silicon nanowires can be used to improve solar thermal energy efficiency. Solar energy is the most abundant source of renewable energy on our planet, and using thermal energy to capture this energy could play a key role in increasing our use of this form of alternative energy. Solar thermal energy is comparatively inexpensive, easy to implement, and efficient compared to many other forms of energy, and using silicon nanowires could be the latest breakthrough in improving this efficiency. Silicon and silicon nanowires are used extensively in photovoltaic electrical energy generation, but have not traditionally been used extensively in thermal energy collection. However, new research into the thermal properties of silicon nanowires has found they are significantly more efficient in thermal conversion than traditional silicon plates. The study, conducted in a controlled laboratory environment, showed that silicon nanowires outperformed silicon plates significantly. The cumulative rate of solar irradiation and absorption was 18% higher when using silicon nanowires. This increase in the absorption of energy comes primarily from increased absorption of light in the visible spectrum with only a slight decrease in absorption in the infrared spectrum. 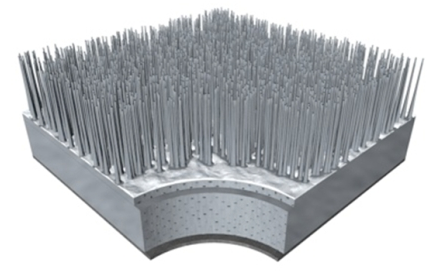 Significantly increased rates of thermal energy capture opens the possibility of using silicon nanowire structures in both pure thermal energy production, hybrid technologies that combine photovoltaic solar cells and thermal energy production. These hybrid systems are still in the conceptual stage, but potentially solar cells could cover thermal energy systems such as water tank heaters and be used to generate electrical power and thermal energy. The use of silicon nanowires will require further research to determine the optimum use, especially given the necessity of researching the technology outside of a controlled laboratory environment. However, although this breakthrough is still in the early stages of application, its long term possibilities are very exciting and merit further research. This entry was posted in Griffin Merians, Photovoltaics and tagged Abdoul Sekone, alternative energy, Chia-An Liu, Energy, Green Energy, Ming-Chang Lu, Ming-Tsang Lee, nanowire, silicon, Solar, thermal, Wen-Kai Chen, Yu-Bin Chen by Emil Morhardt. Bookmark the permalink.